The history Colonial Beach goes like this. In the 19th Century, a bathing and fishing resort existed in what would later be known as the Town of Colonial Beach. Being easily accessible by boat, the Town’s location on the Potomac River was an asset during a time when cars weren't around and road travel was slow and restrictive. Most of the visitors came in by boat from Washington, D.C. to fish from boats and piers and bathe at the mile-long sandy beach. Colonial Beach soon became known as the “Playground on the Potomac.” They arrived via steamer ship and later, by plane at airports like the Reno Skypark that operated in the area from the mid-1950's to the mid 1960's. One of the most important historical events happened twenty-five years after Colonial Beach was founded as a vacation and beach resort. It became an incorporated town, organizing on February 25, 1892. The town flourished as a resort and experienced a building boom of Victorian-era homes, bungalows, summer cottages and grand hotels. Legalized gambling casinos and travel via automobile to oceanside resorts became increasingly fashionable. Shorter, weekend trips took the place of the extended vacation which formerly kept the big hotels in Colonial Beach filled with guests. For the past few decades, rapid population growth in the Washington metro has helped Colonial Beach to regain its appeal as a waterfront resort and a favorite vacation destination for many. 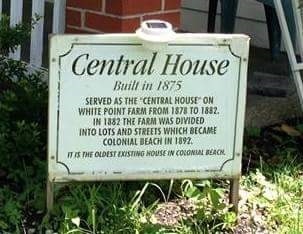 Here's a chronological account of the historical events which have taken place in Colonial Beach. 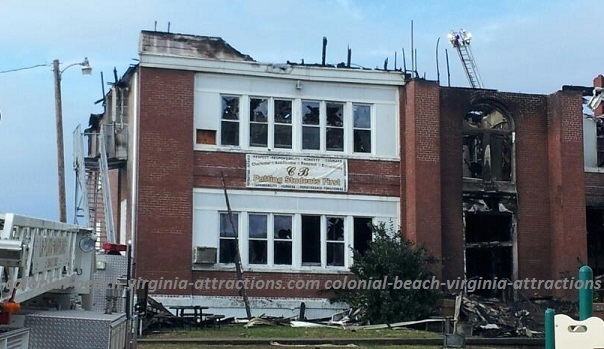 January 5th: The original Colonial Beach High School building, currently being used as the Elementary School is devoured by fire. September: 1st Annual Alexander Graham Bell Croquet Tournament is held at The Bell House. June 9th: Law Enforcement Torch Run for Special Olympics Virginia is held for the first time in Colonial Beach. May 15th: Northern Neck Strongman Competition is held at Monroe Field sponsored by Colonial Beach High School and the Virginia National Guard. March 29th: Virginia Cross Country Racing Series (VXCS) holds a race in Colonial Beach. March 13th: Colonial Beach High School Drifters basketball team win State Championships. June 16th: Jamestown 400 reenactment of Captain John Smith's 1608 expedition up the Chesapeake Bay. His visit back then was an important historical event in Colonial Beach's past. April: James Monroe Birthplace Monument opens on Rt. 205 just outside of town. Colonial Beach Volunteer Fire Department purchases its first tanker, which replaces Engine 11. Colonial Beach Volunteer Fire Department purchases its first fire boat, a 24-foot Monarch. Colonial Beach acquires "Golf Cart Town" designation. Hurricane Isabel deals a blow, and blows a lot of things over. More photos at this page and here. April: Colonial Beach Yacht Center suffers major fire damage. Colonial Beach Historical Society is formed. September 21: The Bell House Bed and Breakfast is placed on the National Register of Historic Places. The Colonial Beach Hotel is reduced to rubble. The Beach gets written about in Frederick Tilp’s book. Sun and Suds Boogie Van Show at the Colonial Beach Dragstrip. March: The Mayfair Theatre at the corner of Washington and Wilder is destroyed by fire. Colonial Beach Police gets new headquarters, in the old firehouse. Football program begins at Colonial Beach High School. August 11: Devastating fire destroys the Beach's Reno and Monte Carlo casinos. "Oyster Law" is put into place. August: Virginia State Firemen's Association convention is held in Colonial Beach. Maryland and Virginia governors reach a compromise over the Oyster Wars. Virginia persuades Maryland to pull the plug on offshore gambling. Category 4 Hurricane Hazel, the worst one of the season hits Colonial Beach. Sept. 28: King Cotton Hotel is gutted by fire. Blackistone family sells the Colonial Beach Hotel to Delbert Conner. Colonial Beach Volunteer Rescue Squad is formed. July 9 & 10 2nd Annual Colonial Beach Regatta. August: "Field Day" track and field competition held at the high school. Route 301 Bridge over the Potomac River opens and creates easier access to the Town. L. L. Curley purchases the 11-month-old "Pete" a black bear from North Carolina who delighted visitors until his death in 1944, when he weighed 600 lbs. 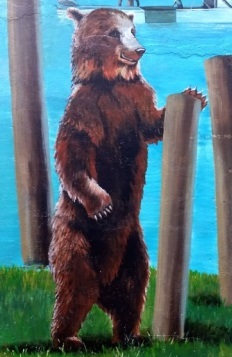 He is depicted in a mural on the side of the Curley Packing Co. building at the Monroe Bay Marina on Lafayette Street. August: Chesapeake and Potomac Hurricane wreaks havoc at Colonial Beach. The Vernon House suffers major fire damage. The Tides Inn Bed & Breakfast is built, originally called the SACO House. March: Colonial Beach Volunteer Fire Department forms. 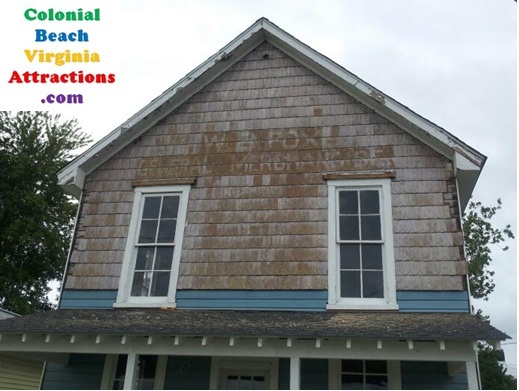 Colonial Beach Improvement Company forms to establish a steamboat wharf and summer resort. February 25: CB incorporates and becomes a Town. The Bell House is constructed. Central House is constructed. It still stands today at 120 Boundary Street. Steamboat Wawaset catches fire and sinks on the way to Colonial Beach. Maryland Oyster Navy is established. The community of Colonial Beach is founded. Colonial Beach has lots of it! If you have historical events information which is missing from this listing, please let me know so I can include it.